Jennifer has taken on Lois’ roles of Ursula in Much Ado About Nothing and Paulina in The Winter’s Tale for the rest of the season, as Lois has had to leave us for another acting commitment. Both have been with Bard for many years, with Lois directing Pericles last year (and winning a Jessie for her work) and Jennifer appearing last season as Mistress Quickly in The Merry Wives of Windsor and the Nurse in Romeo and Juliet. We asked them both about their characters this year and how they handled the switch. What particular skills did you need to draw on to portray Paulina in The Winter’s Tale? Jennifer: I focused on very thorough text work. Finding sense and meaning in the words and really trying to craft the thread of thought and persuasion in her dialogue. If you focus on the way Shakespeare has structured the verse and punctuation and the particular words he has chosen, it gives you so much insight into character development. This was a necessity because I had no time to develop this in the rehearsal hall. Which might have been the biggest difficulty; not developing Paulina with the actors in rehearsals. It required faith in the text that I hadn’t completely relied on before. Faith and trust in everyone involved. And also motherhood. The sense of fierce protection that has awakened from becoming a mom. Reunion as well, I think. Having emotional access to the reality of great reunions in my life. How deeply moving and life changing they can be. Lois: I considered what “faith” means. Paulina says “it is required you do awake your faith.” This seemed to be the key to understanding her relationship to the cosmos, and I think also a key to what Shakespeare was contemplating later in his life: faith, wonder, magic, and hope – past reasonable expectation. In order to portray Paulina, I had to enter into a state of deep faith – and that was an extraordinary place to inhabit. 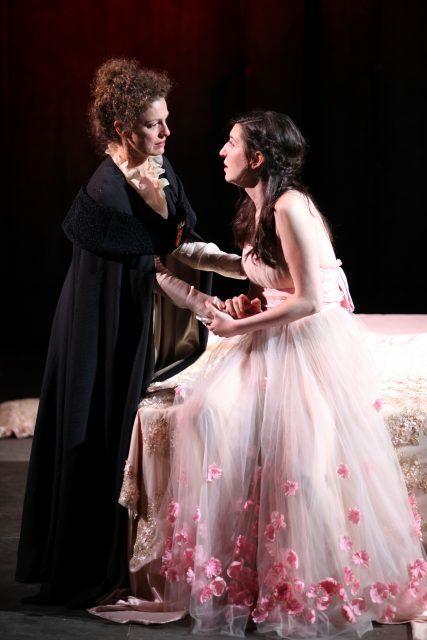 What has been most enjoyable about taking on playing Ursula in Much Ado About Nothing? Lois: Ursula is a small part in the scheme of Much Ado, but for that reason, I could really create her from scratch. Based on the costume designs of Christine Reimer, I began to discover a playful, loyal, extremely efficient secretary who has a long history with the family. Smaller characters are so rewarding to create because you are given so few lines to base your sketch on, and therefore you have such freedom to fill in the life story, and backstory of the character. Jennifer: Being part of the world John created – the cast, the music, the costumes, the dancing. It’s a delightful world to live in. I feel like a fly on the wall and I get to take in the beautiful dialogue of one of my favourite plays nightly as the sun sets over Vanier Park. La dolce vita! Knowing Lois Anderson and her body of work, what do you think she brought to this season and these characters? Jennifer: Lois is a generous, kind, positive artist whose work always reflects these qualities. She brought joy, faith, wisdom, maturity and nobleness to her Paulina. She has that special glint in her eye that is unique only to her. Like she has a great secret. It draws the audience in. She also moves beautifully. I was mesmerized by her hands. Knowing Jennifer Lines and her body of work, what do you think she will bring to this season and these characters? Lois: I suspect Jennifer Lines will bring enormous heart, intelligence and conviction to Paulina. Her Ursula will be a spitfire, with a delicious laugh and fabulous moves. 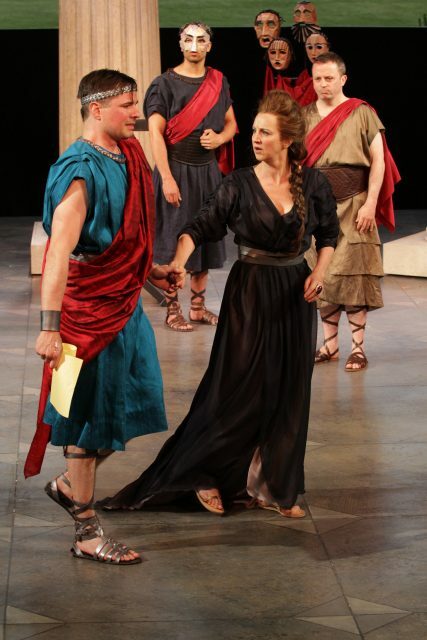 Watch Jennifer Lines in Much Ado About Nothing or The Winter’s Tale from now until the end of the season.